Project77 are creators of great apps designed for Windows 8, Windows Phone and apps for Office and SharePoint. We are currently developing a host of apps designed for the Windows 8, Phone and Office app stores. We plan to release a number of new apps in the coming months all designed at making your digital life easier to manage. 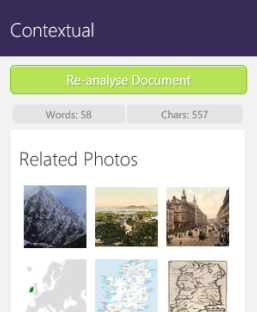 Contextual is an app for Word 2013. It analyses the content in your documents and provides related images and articles based on the content of your document. You can use contextual to find images and the latest news articles published on the Internet without the hassle of searching through realms of web pages on the Internet to find what you are looking for. Once you've found an image or news article you like from with the Contextual app, you can insert the image or article with a simple click of a button. The app also gives information on the number of Words and Characters used in your document. Why not download it today and give it a try - you will not be disappointed. 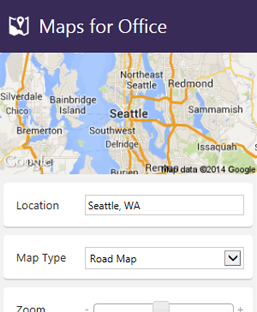 Maps for Office is an app for Word 2013 & Excel 2013. Maps for Office allows you to search for a location using either an address or GPS co-ordinates. Once you have your desired location, you can change the view to satellite or road map and insert the map directly into your document. There are many other features to allow you to create the app you want, such as changing the zoom level and adding a pin to the map to identify your location. The app is available today on the Microsoft Store. The Baby Games app is a very simple game idea designed specifically for babies and toddlers aged 6 months to 3 years old. Using a very simple concept, the app is designed to help your baby learn to match sounds with different animals, while at the same time improving your baby's hand to eye coordination. Your baby will have lots of fun and learn to associate animals sounds with the animal on screen. 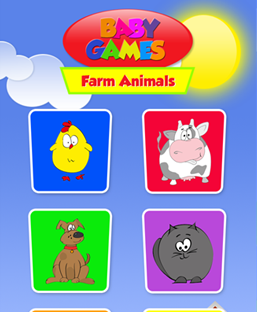 We're delighted to announce that Baby Games Farm Animals, the popular Windows 8 app, is now available on the Windows Phone Store. 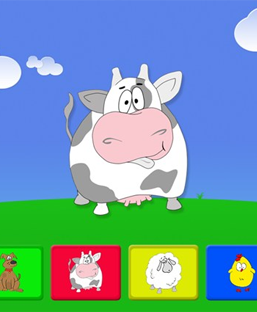 Just like the Windows 8 app, The Baby Games app is designed specifically for babies and toddlers aged 6 months to 3 years old. You can also catch me on your Social Network of choice.